Handmade ring made with lots of love. 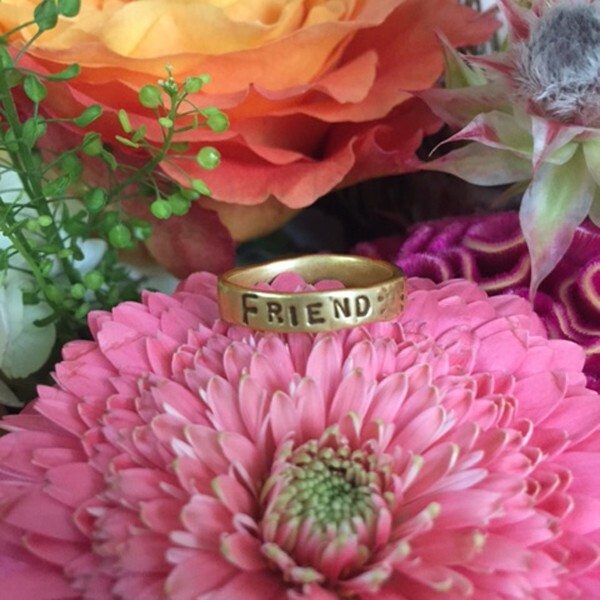 The friendship ring is hand stamped with designs of love all the way around with the word FRIEND stamped in the middle. Perfect gift for your BFF! This beautiful ring is the perfect gift for your bestie. The ring was made by our artisans here at N&L and is a one of a kind piece. Gold Bronze hand-crafted ring with symbols and the word "FRIEND" stamped on the outside. Please note, some people have an adverse reaction to gold bronze and it can discolor the skin around the finger. There is no test for this reaction so if you have had jewelry turn your skin before we recommend not ordering this ring.